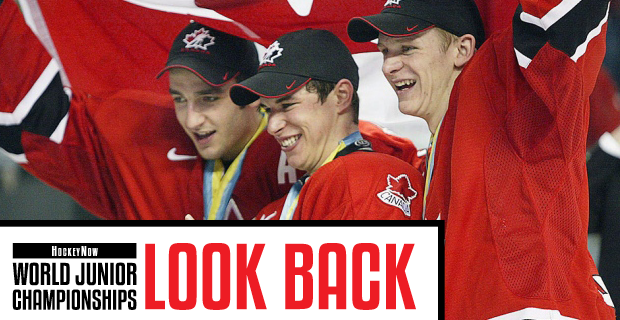 Seven years of frustration ended on Jan. 4, 2005 with a flood of goals and gold medals for everyone on what was probably the best team Canada had sent to the World Juniors up to that point. 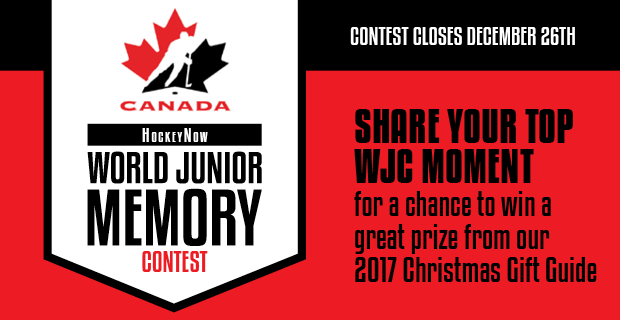 Team Canada put the finishing touches to the 2005 WJC with a dominant 6-1 victory over Russia in the gold medal final game in Grand Forks, ND. Ryan Getzlaf scored in the first minute of play and he was joined on the scoreboard by Danny Syvret, Jeff Carter, tournament MVP Patrice Bergeron, Anthony Stewart and Dion Phaneuf. It was Canada’s fourth straight trip to the World Junior finals, but the first gold medal since 1997. Canada went unbeaten and virtually unchallenged in the tournament, winning four round-robin games by a combined score of 32-5 and then defeating the Czech Republic 3-1 in the semifinal round. Team Canada’s performance reflected the “perfect storm” setting for its long-awaited gold medal. Twelve players returned from the 2004 silver medal-winning team and the NHL lockout made a large number of 19-year-old players available, including Bergeron (Boston), Carter (Philadelphia), Phaneuf (Calgary) and Getzlaf (Anaheim), all of whom were ticketed for regular NHL duty that season. Another key factor was Hockey Canada asking Brent Sutter to step in as head coach. Sutter kept training camp numbers to a minimum and selected an experienced squad of twenty 19-year-old players. Only Sidney Crosby and defenceman Cam Barker were eligible to return for 2006 IIHF Under-20 tournament in B.C. Another factor was that Canada’s top two rivals, Russia and Team USA, had inexperienced playing rosters and coaches, respectively. The Russians had one of the youngest teams in the tournament (10 players eligible for next year) and Team USA was disorganized under head coach Scott Sandelin, a replacement appointee for veteran coach Dean Blais. Canada’s dominance was evident from the tournament-opening game on Christmas Day against Slovakia, a 7-3 victory. The toughest game was the semifinal, in which Czech goaltender Marek Schwarz kept the score respectable. In the final game, it took Canada less than a minute to put the Russians back on the heels. Getzlaf took a drop pass from Carter and blistered a slapshot past goaltender Anton Kudobin. At 6:23 of the first period, Danny Syvret banked a shot off Kudobin from behind the red line to give Canada a 2-0lead. The Russians got back in the game late in the first period. A shot from the point by Alexei Emelin was slightly redirected off the stick of penalty killer Stephen Dixon and slipped past goaltender Jeff Glass. The turning point of the game came early in the second period. At 3:33, Kudobin misplayed a wrist shot by Carter, resulting in a weak goal and a 3-1 Canada lead. The Russians changed goaltenders, bringing in Andrei Kuznetsov. A few minutes later, Glass made his best save of the game, stopping a slapshot from speedy Russian winger Enver Lisin and controlling the rebound. Phaneuf separated Lisin from the puck and in the process knocked a second Russian to the ice. The loose puck ended up on Crosby’s stick and the rebound of his rocket slapshot from the left wing went from Corey Perry to Bergeron for an easy goal at 7:53. Sixty-one seconds later, Stewart deftly redirected a perfect pass from Nigel Dawes to give Canada a 5-1 lead. Phaneuf applied the coup de grace with a power-play goal at 13:19 of the second period. Russian star Alexander Ovechkin, named the tournament’s outstanding forward, was not a factor. He had only a couple of shifts after a clean check by Bergeron early in the second period. Phaneuf was named the top defenceman of the tournament. Schwarz, who had another outstanding performance in the Czech Republic’s overtime victory over Team USA in the bronze medal game, was named top goaltender. Carter, Bergeron and Phaneuf were named to the tournament all-star team, joining Schwarz, Ovechkin and Team USA defenceman Ryan Suter.